Do people that stand on the side of roads twirling things, wearing sandwich boards, waving, and wearing crazy mascot outfits cause you to make an immediate decision to stop and take them up on their offers? Or, have they just become a part of the scenery? From an employers standpoint, who makes the decision that this works, and therefore a corporate memo goes out saying that soon, all branches would receive a trunk in the mail that houses a mascot uniform for some lucky part timer to have to model up on the corner of 9th and Broadway? I saw a beauty earlier this week while driving to Lodi from Sacramento. The local Subway must have worked the seniority card and sent the newbie out to the street carrying a huge sandwich board (how ironic, being a subway) which straps to the newbie over the shoulder like a guitar strap. I loved it. Slouched over with the board just hanging there, the employee just sat there looking down as she was text messaging the whole time. Nice investment in payroll there. Everything I saw there told me everything I needed to know about that Subway shop… Don’t shop there. Seriously, that’s going to get me to stop everything and crave a foot long. Of course, as much as they have played that jingle makes me never to want to have a foot long ever again. But, I digress. Point here is… where do you want me to start making points? No engagement equals no business. I always love the Little Caesar mascot that carries a guitar like something and waves at me as I drive home each day. Well, maybe it just seems like a guitar because the mascot always seems to be rocking out on it like it is a guitar. My other thought here is… I thought this was Little Caesars? If so… why is this mascot outfit like 6 feet tall? From my point of view… this person is engaging. It doesn’t make me want their pizza any more or less. It’s just the person inside does really funny things that catches my attention. It makes me wonder if Little Caesars has a training video for this and Subway does not. If so, I would so love to see this. It probably wouldn’t be better than the Krabby Patty training video from Spongebob, but it would be a potentially sweet view. 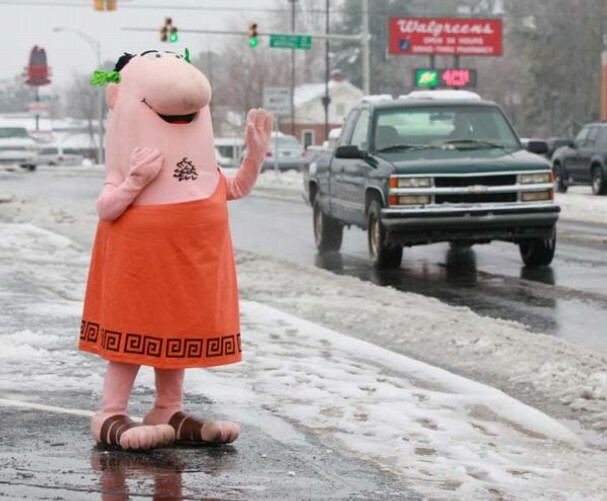 Quite frankly… does Little Caesars really need to spend payroll dollars on this? Doesn’t the fact that they have $5 pizza do the job for them? I remember one evening driving home with my daughter. It was dusk and getting dark quickly when we drove by the local Wendy’s. Now, where they are located is where the turning lane starts for me to take a right and head towards my neighborhood. With that said, who’s idea was it to dress up an employee to look just like Wendy and stand on the curb waving to cars? Secondly, I nearly hit her and sent her straight to the McDonald’s drive thru window next door. She either wanted to make the best of it or was threatened by her job to go drum up more traffic. Either way… bad move and not effective. I have actually over the years have begun to appreciate the furniture clearance folks that stand at street corners with their signs. To be honest… these folks have mastered the art of twirling. Sometimes, I may even get a few honks from behind me because I don’t catch that the light turned green because I was enamored by their talent. Of course, I never stop or check out what they are pawning, but… they sure are engaging. I myself had the opportunity to do this once. I refused. The owners wanted me to put on a clown outfit and stand on the sidewalk of the busy street holding a sign that said… we have Bibles. This morning on my way to the airport, I was so bummed that I didn’t have my camera ready to snap the grand poobah of mascots. It was for a brake repair shop and no kidding… it must have been 4 feet tall and it was a brake with two hands sticking straight out and of course legs. The poor mascot outfit didn’t appear to allow for the person inside to control the arms and hands so they just stood there and wagged back and forth to try to give us passerby’s the appearance of them waving. The eyes and the smile on this lil feller were priceless. I laughed out loud inside the super shuttle on that one. Now, for that… I may consider pulling in to have my brakes checked. Was I personally engaged by this? Not really. But, was it ever silly looking! In the end, we all need something silly to engage our peripheral vision. It gives us a break from focusing on things that we are generally obligated to. Not sure it’s a good investment by employers. But, it sure takes the edge off life sometimes. Have you seen one lately? Have you been one lately? Do they work? I am not even sure why I am writing this… it’s how I think while I wait to board another plane. Yours is much more in depth though – love it! The guy I focused on who dances on the corner holding a sign is extremely engaging, spawned a Facebook “Like” page (not started by him or the company he works for) and he’s responsible for 25% of the traffic that walks through doors. Keep up the great work G-Man! Ana and I have talked about this before. She hates sign wavers and thinks it degrades any business. I think it has a place and has to be done right. The sign waver is as good as a billboard and even better usually. It’s a lot easier to remember where a business is if you’ve seen that waver. For years I have driven eastbound on HWY26 And until just recently I couldn’t have told you that Seven Dees, or is it 7 Dees, was right there by HWY 217. You’d think that location would be good enough but I think it was stopped traffic that did it. Just the sign and business isn’t good enough sometimes. That sign waver is cheaper than a billboard, only costs you when you activate it, and will garner more attention, as long its done right for the right business.